Dehradun is the state capital of Uttarakhand. A city housing many important institutions of the country. Forest Research Institute (FRI), Survey of India, Wildlife Institute and Rashtriya Indian Military Academy (RIMA) are all based here. The RIMA was previously Royal Indian Military Academy back in the days. The zeal to wipe away the vestiges of colonial rule was not match by the foresight that the R could easily be interpreted as 'Royal' (which was my first guess). The city also houses many of the finest schools in India as evidenced by the many uniformed school children in a manner not unlike wandering through Eton and seeing the traditionally dressed students. They're also the most polite Indians I've come across so far. I arrived here after a 1.5 hour bus ride from Rishikesh Bus Station. Found a hotel, put my bags down and set about my Dehradun itinerary. From the Clock Tower, I was able to get a taxis to the Wada Institute of Geology and FRI. The museum in the Geology Institute is surprising small and sparse for a country that contains such diverse geology. The museum was still interesting, but disappointing when comparesd to similar museums in the UK. Give it a visit even if you've no knowledge of geology. The forestry museum was even more disappointing than the geology museum. If you do have some background in biology, then the FRI is worth a look. Otherwise, don't bother as the exhibits are poorly labelled and it's hard work guessing at the narrative of the displays. If you are planning on a trip, be aware that it's quite a trek from the entrance of the FRI to the museum building. The last item for today was the Sai Darbar Temple, on the way back to my hotel. It's supposed to be a temple of high spiritual value. Purely from an aesthetic point of view, it's not much to see. Northern India and especially Uttarakhand has thriving Tibetan communities, built by refugees from Tibet. The Tibetan community near Dehradun is concentrated about 10km south of the Dehradun in Clement Town. Known as Mindrolling Monastery, it boasts a large monastery, a large college, a five-storey Great Stupa. According to the blurb at the monastery, the stupa at 60m, is the world’s tallest and contains a series of shrine rooms displaying figures of various Lamas, Buddhist relics, Tibetan art and dedications to the Dalai Lama. 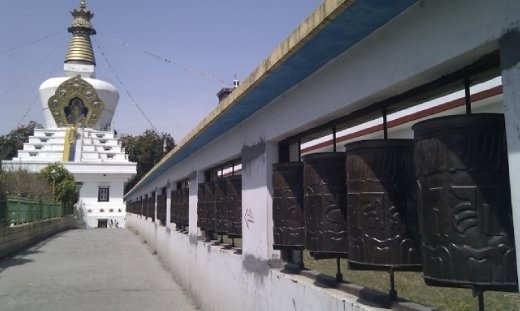 Within the stupa complex are gardens, prayer wheels and one restuarant that serves only 2 items, momos and noodles, which explains the lack of menus. The momo are a lot like chinese dumplings and authentic i.e. no spice. They were so good I ordered a second portion. A short walk from the stupa complex is a garden area containing a 35m gold Buddha Statue, dedicated to the Dalai Lama. Interestingly, when you finally get to the statue, it seems to watch over the stupa complex. Having travelled on local buses in a few cities now, an observation about Indian tactics for catching buses is worth mentioning. Instead of getting onto the parked bus at the central bus station (like me), Indians prefer to congregate just outside the entrance and apply the every person for themselve mad rush onto the bus strategy. Very strange.